Slow Swirl at the Edge of the Sea pictures two creatures dancing between sea and sky, surrounded by arabesques, spirals, and stripes. The forms "have no direct association with any particular visible experience, but in them one recognizes the principle and passion of organisms," Rothko said. 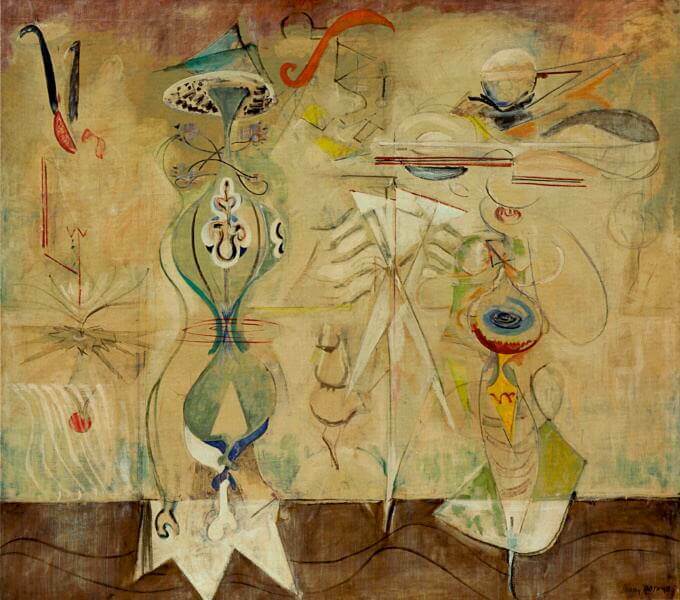 For him art was "an adventure into an unknown world"; like the Surrealists before him, Rothko looked inward, to his own unconscious mind, for inspiration and material for his work. Early on in his career, Rothko saw art as "an adventure into an unknown world" and, like the Surrealists before him, sought to create universal symbols drawn from the subconscious. Slow Swirl at the Edge of the Sea shows two sinuous biomorphic creatures that seem to float between sea and sky, surrounded by arabesques, spirals, and stripes that can be read as musical symbols. 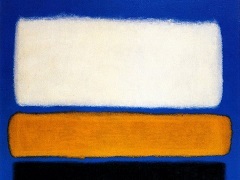 Rothko maintained that the forms "have no direct association with any particular visible experience, but in them one recognizes the principle and passion of organisms." He applied the paint in transparent layers - a practice he retained when he abandoned representational images and began to develop his large-scale color field paintings a few years later.